The sediments of Chesapeake Bay harbor a record of the Bay's ecology, from its "natural functioning" thousands of years before European colonization through post-Colonial settlement and the continuing forest clearance throughout the watershed. Translating that record into a history of ecological change has been the focus of Grace Brush's paleoecological research at the Johns Hopkins University for more than thirty years. 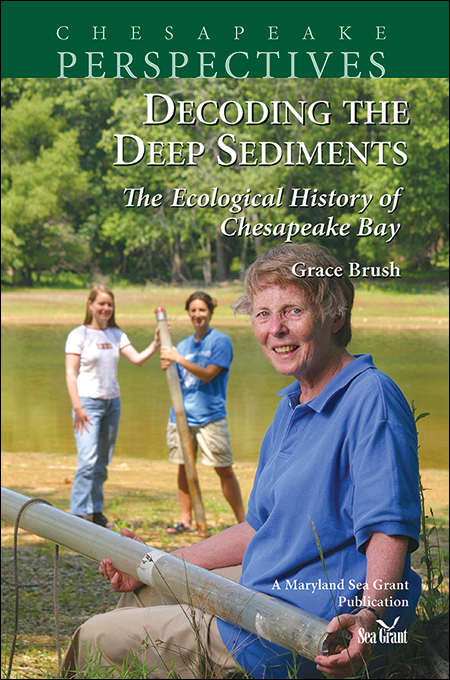 In Decoding the Deep Sediments, she explains the nature of the studies she and her colleagues have been engaged in and how they analyze the hundreds of sediment cores they have taken throughout the Chesapeake. Their work has demonstrated how the cutting down of trees and large-scale land-use changes have affected the Bay's ecosystem in massive runoff of sediment and nutrients, all of which have contributed to the decline of water quality. A major effect has been the shift from an ecosystem once dominated by benthic processes to one now dominated by pelagic processes. A professor at Johns Hopkins University, Brush ends the book with cautious optimism about a possible future for the estuary as she looks ahead from this historical view. She predicts that, if the harmful effects of some human activities can be reduced through tree-planting and related efforts, the Chesapeake Bay could eventually transition toward a healthier, benthic-dominated ecosystem like that of its pre-Colonial past. Victor S. Kennedy and L. Eugene Cronin, editors. Order from our Book Store. The blue crab is a significant U.S. commercial and recreational species that ranges from the Mid-Atlantic to the Gulf of Mexico. 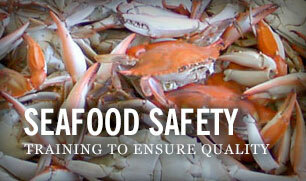 In Chesapeake Bay, the blue crab has become a regional symbol, as well as the Bay's most profitable seafood product. 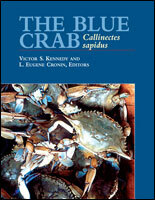 Well-known marine biologists Victor Kennedy and the late Eugene Cronin, winner of the Mathias Medal, edited this 800-page volume and assembled scientists who are leaders in their respective fields of blue crab study to provide this first comprehensive overview of the science surrounding the blue crab. The Blue Crab includes chapters on systematics; anatomy of larval, juvenile, and adult stages; molting and growth; reproduction; diseases and parasites; physiology; ecology of all life history stages; history of blue crab fisheries in the U.S.; and population dynamics. Peter W. Bergstrom, Robert F. Murphy, Michael D. Naylor, Ryan C. Davis, and Justin T. Reel. Order from our Book Store. Underwater grasses, or submerged aquatic vegetation (SAV), play a key role in the ecology of coastal waters, and especially in the Chesapeake Bay. These grasses help keep waters clear and provide habitat for blue crabs and fish, and food for waterfowl. Over the past several decades, clouded waters have blocked sunlight and smothered many SAV beds. Efforts are currently underway to help map, study, and reestablish SAV in the Chesapeake and other coastal waters. To help citizen volunteers, students, and others interested in learning more about these plants, we produced this guide to underwater grasses in collaboration with NOAA’s Chesapeake Bay Office, the Alliance for the Chesapeake Bay, and the Maryland Department of Natural Resources. Michael W. Fincham, Producer, Writer, and Director. Watch a trailer for the film. Order from our Book Store. The Chesapeake was once home to the richest oyster grounds in the world. The native oyster, Crassostrea virginica, built massive reefs and filtered vast reaches of the Bay, removing algae and sediment. Then, the reefs became a mere shadow in the Bay’s past. This film details both the poignant destruction of a fabled fishery and the prolonged scientific inquiry into the origins of a killer parasite. It peers toward a future where the Bay's oyster grounds may shrink to low-salinity areas where disease does not dominate, questioning if we can save both the oyster reefs and the oystermen. The film was broadcast on Maryland Public Television annually from 2011 to 2014 as part of their Chesapeake Bay Week programming. The film has been shown at the RVA Environmental Film Festival in Richmond, the Annapolis Green Film Festival, and the DC Environmental Film Festival. When watermen found wounded fish along a lonely river in Maryland, they kicked off a scientific debate and an environmental crisis focused on a mysterious microbe that may—or may not—cause sick fish and sick people. The Pfiesteria Files follows all the players in this crisis—watermen and farmers, doctors and scientists and state officials—as well as the journalists who reported the story to an anxious public. It investigates the origins of the "Pfiesteria hysteria" that gripped much of the mid-Atlantic during the September fish kill season of 1997, and examines the dangers of toxic blooms in coastal waters around the country. This film has won several awards, including a local Emmy for long-form documentaries and a World Gold Medal for the New York International Film and Television Festival.